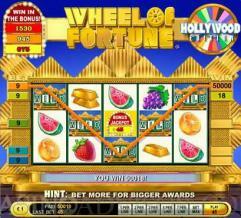 Wheel of Fortune is a five reel video slot from Wagerworks. It is based on the popular television game show that offered Hollywood sized prizes. In the slot game these prizes take the form of symbols on the reels. They include a South Sea vacation, a Cruise, a Ring, Triple Gold Bar, Double Gold Bar and Single Gold Bar. Wheel of Fortune also pays tribute to the classic slots by having fruit symbols like Melon, Grapes, Orange and Strawberry. The most important symbol of all is the Wheel of Fortune logo that offers payouts even if one symbol appears in enabled payline. In addition there are three special symbols, which are the Wild symbol, the Jackpot symbol and the Bonus symbol. Wheel of Fortune offers a single coin denomination of 1.00. The slot game has five paylines. The number of paylines is not chosen in a predetermined sequence by clicking a single button outside the reels. But paylines can be activated individually by clicking the box next to the payline in the reels itself. The number of coins per payline can also be individually selected in this manner by clicking the same payline again and again. Hence Wheel of Fortune can be played with unequal wagers on different paylines. The coins allowed per payline are 1, 2, 3, 5, 7 and 9. Players who want to play with the same number of coins on each payline can select the appropriate number from the buttons provided below the reels. The wild symbol is the Wild logo. It substitutes for all symbols including the Wheel of Fortune Logo, but not for the Jackpot symbol and the Bonus symbol. Five Wild symbols on a payline at maximum bet payout a jackpot of 50000 coins. The second highest jackpot is paid by the Wheel of Fortune Logo. When five of these appear in an active payline the payout is 2500 coins. The highlight of the Wheel of Fortune Logo is that it pays out when a single symbol appears on the first reel as well. Therefore the Wild symbol appearing on the first reel substitutes for the Wheel of Fortune Logo and pays out double according to the pay table. 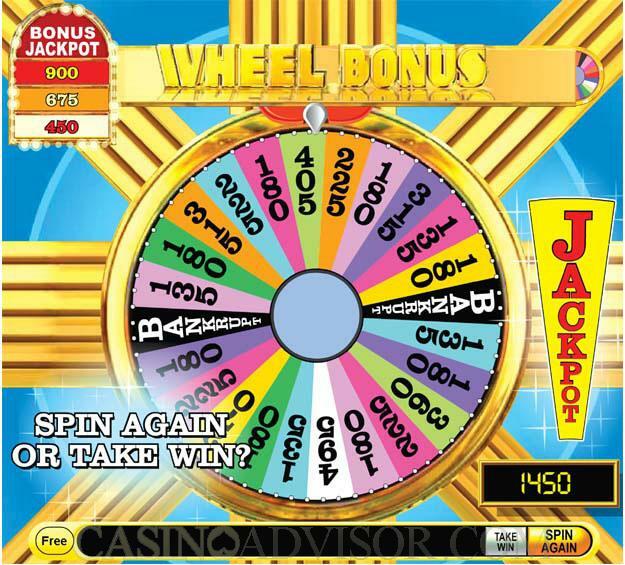 Another feature of Wheel of Fortune is that unlike bar symbols also result in payouts if they appear in an enabled payline. The music and the crafting of the symbols are adequate. Only a few of the symbols are animated. The best animation is in the Wheel of Fortune Logo, which starts spinning when it results in a payout. The other symbols that show some animation are the Wild symbol and the Jackpot symbol. 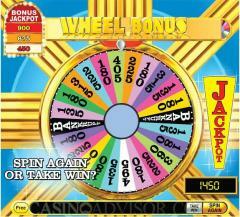 Interested in reading more detailed information about Wheel of Fortune? If so Click Here for more details.